Sapphire engagement rings are an excellent choice for couples looking for an alternative to diamonds. Sapphire gems create beautiful and unique engagement rings. The most common and recognized color for sapphires is deep, royal blue. However, sapphires come in a variety of natural colors. So if you're interested in sapphires, but dislike the color blue, you'll probably be able to find a color you do like. In selecting sapphires for an engagement ring, you have to be sure the color doesn't change under different kinds of light. We'll talk about this in more detail later. Sapphires occur naturally, and are mined in places like Sri Lanka, Madagascar, Thailand, Kenya, Pakistan and Myanmar. However, Australia currently produces more sapphires than any other place on earth. In America, Montana has been known to produce a steady supply of sapphires. They can also be found in North Carolina. The most common colors used in sapphire engagement rings are blue, purple, pink, orange, green, and yellow. Sapphires can be a bit tricky when it comes to color. Purple sapphires come in dark and light shades and almost look pink when exposed to light. Sometimes sapphires that are actually pink get mistaken for red rubies. That's because the color of a sapphire sometimes changes depending on the lighting. The colors can change so rapidly, until you may get confused about which gem you're viewing. Orange sapphires appear dark and are rare. Yellow sapphires are the most transparent of all the colors. Green sapphires are the most versatile. They come in shades ranging from blue-green to yellow green. There is one sapphire that's extremely rare, and you've probably never heard it mentioned. Any sapphire engagement rings made using this form of sapphire would cost a fortune. Padparadscha is a rare form of sapphire. It has a pinkish-orange color, similar to the color of a lotus blossom. This rare sapphire is valued for its color which doesn’t occur often in nature. Padparadscha sapphires occur naturally in Sri Lanka, Vietnam, and Africa. Because genuine padparadscha sapphires aren't easy to find, they're often created synthetically in labs. There is a treatment that uses naturally pink and orange sapphires to create fake padparadscha sapphires. Most padparadscha sapphires are heated because the process enriches the color and improves clarity. The heating process does have a damaging effect on the price of the sapphire, but it's an acceptable practice as long as the buyer is aware of it. Heating sapphires is acceptable in the industry because it doesn't involve altering the stone. Please note that heating sapphires and treating sapphires isn’t the same thing. A heated sapphire simply has its color enhanced. It's still a natural sapphire. On the other hand, a treated sapphire is actually changed, and its value is ruined. A treated padparadscha sapphire is basically a fake, and will eventually start to lose its color and tone. If you plan on purchasing a padparadscha sapphire, you should make sure it has a certificate of authenticity from a reputable test laboratory. Sapphire engagement rings that contain natural padparadscha sapphires are expensive. If you find a padparadscha sapphire in its natural state, then you should expect to pay a hefty price. An inexpensive natural padparadscha sapphire may be priced in the range of $5,000 per carat. The price goes higher based on the size, color, tone, cut and clarity of the gem. A price of $20,000 - $30,000 per carat isn't uncommon for a natural padparadscha sapphire. In fact, if you find a deal that seems too good to be true, then it probably is. A low price means you're probably getting ripped off. The trick with natural padparadscha sapphires is getting a good color. Sometimes the gem may look too pink or too orange, or there may not be a good blend between the colors. Sometimes you can actually see where the orange begins and the pink ends. Ideally, the colors should blend into a beautiful seamless appearance. An authentic, natural padparadscha sapphire is among the rarest gems in existence. The gem’s color can't be fully appreciated or judged with a photograph. As stated earlier, the color of all sapphires has a direct relation to the lighting. If you plan on creating sapphire engagement rings using natural padparadscha sapphires (or any type of sapphire), you should see it in person. Not all sapphire engagement rings cost a small fortune. There are several less expensive options to choosing sapphires. Thankfully, sapphires are generally less expensive than diamonds. When you're selecting sapphire engagement rings from online stores, you should check to see if the company is registered with the Better Business Bureau, has an address and phone number listed like Novori. This will make your online engagement ring purchase safe and secure. It's also important to check the store's return policy. You never know, the ring may be damaged, the wrong size, or any other concerns you may have. In addition to budget and quality, you should take style into account. You and your partner should decide which style of sapphire engagement rings you both want. If you plan to surprise your partner, then it's a great idea to get an idea of what type of ring they'd like. This will make the ring shopping process much easier. So go ahead and look for your own sapphire engagement rings. Dare to be different. 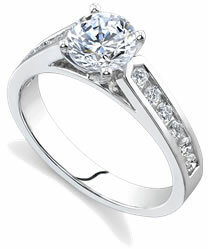 Choose a gem other than a diamond for your engagement and wedding rings. Remember than any setting at Novori Jewelry can be made with a sapphire gemstone if that is what you want. We are always ready to help. Call us at 1-877-877-4141 for assistance anytime.